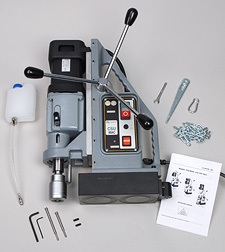 Portable Magnetic Drills – CSU 80AC | Advance Drills Inc.
Portable Magnetic Drills – CSU 80AC Powerful high-torque motor with multiple speeds – holes up to 3-3/16 ” dia. Model CSU 80AC has a powerful, high-torque motor with multiple speeds to match the cutter diameter to the correct RPM. This provides increased tool life and reduced cutter breakage. Included is an automatic cooling/lubrication system built into the arbor. Standard equipment includes auto lubrication, auto chuck cutter holder, safety chain, carabin hook, allen keys, pilot pins and carrying case†. • High-density dual-coil magnet has holding strength of 7040 lbs. Twist Drill Capacity: 1-1/4″ dia. Magnetic Force (1″ Plate): 7040 lbs. With a 3/4″ chuck (Part No. 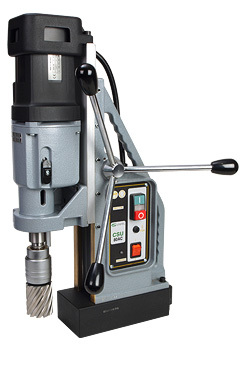 IBC 21) or MT3, this model easily converts to a standard drill press with a stroke of 6-1/2″.